I'm down with Reign Man as #1 - kind of a no-brainer. I think Chambers deserves to be on the list, though. He was in that competition with Stansbury if I remember right. I'd have to throw an honorable mention to Kendall Gill, if anything for being the only Sonic with the nuts to dunk on Mutombo in the playoffs. Also, in his very limited playing time, Chris King had some filthy dunks. I was going to say Kendall GIll, too. He's definitely the greatest boxer-dunker in Sonic history. 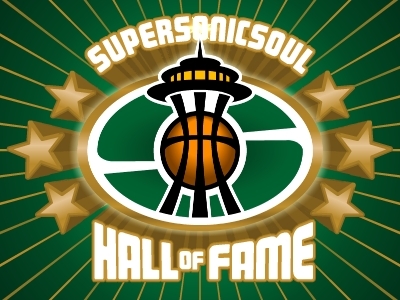 One other nomination would be David Thompson - I know his halcyon days were pre-Seattle, but I'll bet he could still dunk when he played for the Sonics. Don't forget Jim Farmer for the honorable mention category. Dude brought his own funk to garbage time. How about the worst dunker? I would nominate Ricky Pierce for that one ... I don't even know if he could touch the rim by the time he made it to Seattle. Honorable mention: Tom Chambers -- always solid, but even though it was post-seattle his dunk on Marc Jackson is an all itme great. Honorable mention: X-Man -- the man was as hard nosed as any player ever. and beat me 5-1 in a 1 on 1 game at the Sonics Seafirst 7' tall basketball camp. 5. Ruben Patterson: An a-hole on and off the floor, but the boy had ups and attitude. I'm shocked you've all forgotten so quickly. 4. Kendall Gill -- just a physical speciman, his elevation was graceful with great power for a 2guard. 3. D-McKey -- apparently i too remember things most forgot; McKey was a low intensity high talent player. Remember he was the only guy in the leauge with the athleticism to cover Tim Hardaway, Michael Jordan AND premier big men (albeit temporarily.) Really an under-rated leaper. 2. Desmond Mason -- maybe the most fun to just sit back and watch and see what happens. He had that Dominique-Wilkins-Rebound-Dunkability that left your jaw down and your gum on the floor. 1. 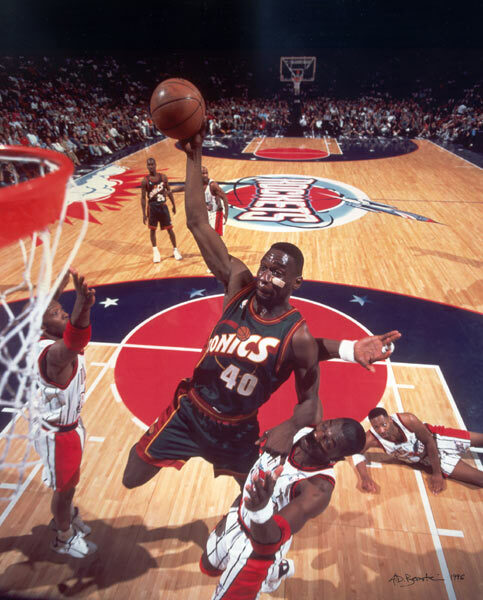 Shawn Kemp -- that McD's game dunk was wicked, and I'd never seen it before. Simply the greatest. Maybe in league history. ricky pierce went to walla walla c.c. and was a wicked dunker there. you have to remember by the time he was with us he was in the twilight of his career. he dunked on my h.s. coach at W.W. and talked smack, "That's on you, white boy!" Heh heh. and a final note-- does anybody else remember the hops GP had in college? He used to catch oops and the only dunk i ever remember him getting in the NBA was the "on Jordan" one. Anybody else remember those camps? They were always a good time, even if there was NO instruction. Any thoughts on training camp? Thursday night (tomorrow) there is a SAVE OUR SONICS & STORM rally at Goofy’s Sports Bar (8519 15th Ave NW; Seattle, WA 98117) from 5pm to 7pm. There will be FREE FOOD and DRINK SPECIALS. -Two tickets to Opening Night against Brandon Roy and the Blazers! -Sonics T-shirt autographed by Ray Allen! -Sonics poster autographed by Luke, Nick and Ray! -A SOS&S long sleeved shirt signed by Slick Watts! Slick Watts is planning on attending our rally for any fans who would like to meet him. Slick Watts is a Sonics Legend and the Director of Community Relations for Save Our Sonics and Storm. After the rally, everyone is welcome to come to Councilmember Nick Licata’s Q&A session located at Olympic View Elementary. Interested parties who cannot attend the earlier rally are still encouraged to attend this meeting and show their support. Why: Because you want to your elected representatives to keep the teams here! For additional information please contact info@saveoursonics.org or brian@sonicscentral.com. Media with interview requests may also contact Brian Robinson via phone at 206-349-6447. 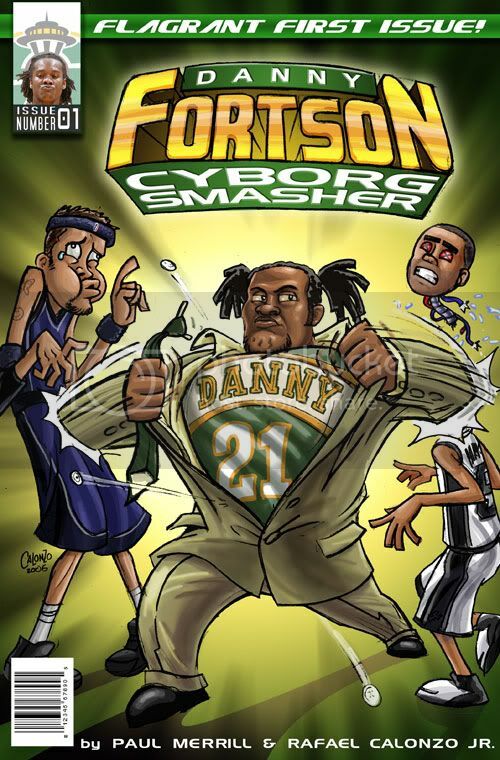 If nobody is going to post anything about this years team, could we at least get a new Fortson comic?